Last fall, Sen. Rand Paul (R-KY) proposed diverting all transportation enhancements funding, which goes primarily to bike and pedestrian projects, to bridge repair. “With nearly 25 percent of our nation’s bridges deemed either structurally deficient or functionally obsolete, we need to make their reconstruction a priority over errant beautification projects,” Sen. Paul said. He also said that the money spent on “movie theaters, squirrel sanctuaries, turtle tunnels and flower beds” could otherwise boost the Highway Bridge Program by $700 million. Forget for a moment that that’s the world’s most preposterous definition of TE ever. 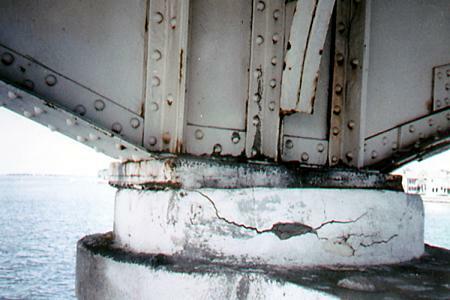 Let’s take at face value the idea that keeping the nation’s bridges in a state of good repair is an important safety issue. Who could disagree with that? In the MAP-21 transportation bill that the president will sign in just a couple of hours, the Republicans did manage to gut transporation enhancement spending. But did they divert that money over to bridge repair? Far from it. In fact, they gutted bridge repair spending too! The bill consolidates two-thirds of highway programs out of existence, including the Highway Bridge Program for the rehabiliation or replacement of structurally deficient or functionally obsolete bridges. Indeed, one of the few performance measures in the bill that really has teeth is the one for bridge repair, which requires states with inferior infrastructure conditions to spend more. However, not everyone is convinced that this will do the trick. “The way they crafted it, yes, [states] could spend a lot on repair,” said James Corless, director of Transportation for America. “They could have spent a lot on repair under SAFETEA-LU.” But they didn’t. The Senate bill dedicated 60 percent of funds from the new National Highway Performance Program to repair and improvements on existing roads. It also allowed gave states more flexibility to use highway money for maintenance and included performance measures. But some of those positive attributes didn’t make it into the final product. “What we ended up with in the conference report were watered down performance measures, much more at the discretion of state, timelines that don’t have those performance measures kick in till after the bill expires, and then, obviously, the complete elimination of repair funds,” Corless said. Indeed, Congress will have to pass a whole new transportation bill before this bill’s performance measures take effect. MAP-21 gives states three years to show that their bridge conditions are sufficient. Performance won’t be measure until March 2015. The pavement condition penalty doesn’t kick in until even later. The bill only lasts 27 months, until September 2014. Those timelines are not necessarily as hare-brained as they look. To measure performance, states collect data in different ways — and some don’t collect enough data at all. Putting in place uniform systems and standards will take some time. But still, it all makes advocates pine for former Rep. James Oberstar’s 2009 transportation bill proposal, which included performance measures that locked in state of good repair. Pretty much everyone agrees that program consolidation was essential – 108 highway programs was too many. But Congress could have consolidated programs while keeping some spending requirements. Imagine that. Republican dishonesty. Why, I never thought I’d see the day when the GOP would be anything less than 100% honest and forthcoming about their agenda and motivations. Your article doesn’t quite go with your headline. It’s a shame you resort to the same type of demagoguery you accuse the Republicans of.